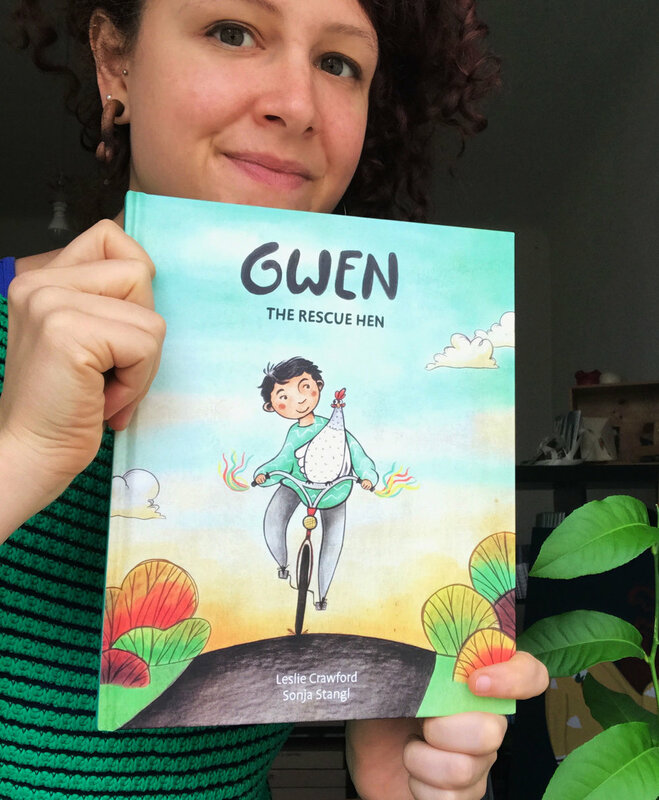 Sonja Stangl, who brought the adventuresome chicken in Gwen the Rescue Hen to life, is a Vienna-based children’s book illustrator with a soft-spot for farm animals. The Vienna-based illustrator’s soft spot for animals was clear in the portfolio she shared with us after we put out a call for illustrators. Of the nearly 200 artists who responded, Stangl’s stood out for her vivid color, almost old-fashioned sensibility and attention to detail, and her appealing renderings of animals. We were thrilled to discover she also happens to have a real talent for story development. Stangl underscores the bleakness of Gwen’s life in an egg-laying factory by illustrating those scenes in stark black and white. "Gwen the Rescue Hen was quite a challenging book to illustrate as it’s a story with a sad background. But the book also focuses on Gwen's way out of this bad life into a brighter one. So when I began, I had to ask, how can I show kids that chickens are way happier out in the green and running about, while still taking into account the dark parts of the story? The first few spreads, when Gwen is still living in the factory, were very important for me. The scenes are meant to be sad and dark but not so cruel they’d overwhelm readers. So to show the monotony and emptiness of a factory chicken's life I refrained from using any color. The illustrations have a dark background to bring across the lack of real sunlight in chicken factories. The line-work is intentionally rough and stylized. The chickens in the cages appear as mere silhouettes to increase the distance between us and them. In this way, I could show their yearning for something without actually drawing the details of their suffering. I think it’s important for scenes like this to convey feelings subtly through color and composition instead of being in-your-face brutal. I mean, who wouldn’t want to get out of there?" The story is inspired by a true event. Years ago, a tornado destroyed chicken farms in Croton, Ohio, and a few thousand survived. Gwen survives, too, and her escape to freedom is drawn in vibrant color. "The big twist (haha) in Gwen's life comes with the tornado. It delivers Gwen to a life outside the factory. This is also the spread where I start to integrate color in order to show that there is a beautiful and vibrant world out there. But first, Gwen needs to get through the storm! I wanted to make the tornado feel kind of threatening, but also exciting and new. The storm is foreboding and discomforting but it is what launches Gwen's journey. Even though it’s kind of a tragic event, seeing a chicken ride out a tornado is also - let’s be honest - great fun! Here I tried to get the reader closer to Gwen and into the tornado. I was hoping to illustrate a sense of being carried away by making the world down below tiny and distant." Stangl use detail and rich color to signal the warmth of the growing friendship between Gwen and Mateo. "Finally, color and happiness have entered Gwen's life. She has emerged from her troubled past and starting to become friends with Mateo. But to live a real chicken life, Gwen needs to find out what chickens actually do when they are free. In these pages, I wanted to focus on Gwen and Mateo's growing friendship by illuminating their daily routines. Instead of simply roosting, she is seen preening and taking dust baths for the first time. These are everyday scenes and both Mateo and Gwen find themselves doing what they normally would, each in their own unique fashion, but also side by side. These moments are all about building a relationship and learning to trust one another." Gwen’s new friend Mateo manages to reunite Gwen with a few of her old friends. He had learned that chickens are much happier when part of a flock than on their own. “Spoiler alert! All is well in the end. Gwen has a new life and is doing what chickens are meant to do. She is free to be herself and surrounded by her flock. I had lots of fun illustrating this growing friendship between human and chicken and hope everyone claps this book shut with a good feeling, which I also hope includes compassion for farm animals and the lives they live." Lydia Chodosh is a former News Fellow. She’s now working in design production for Harper’s Magazine. Gwen the Rescue Hen is available for sale.